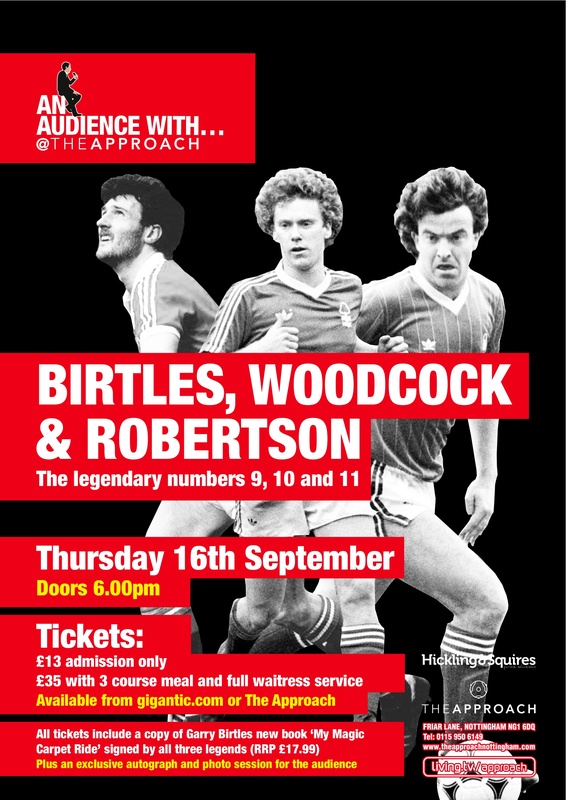 23 | August | 2010 | Through the seasons before us..
An evening with Birtles, Woodcock and Robbo! A trio of Forest legends are on offer for your entertainment pleasure – quite literally a 9, 10 and 11. Garry Birtles, Tony Woodcock and John Robertson to be precise – and it’s actually quite the bargain too. Whilst at first glance £13 might seem an odd price – this includes a copy of Garry Birtles’ new book ‘My Magic Carpet Ride‘ which will be signed by all three. So, the time – from 6:00pm, the date – Thursday 16th September, and the place is The Approach on Friar Lane. It should prove an entertaining evening, if not just to heckle Birtles for his rubbish column in the Evening Post – plus even somebody too young to have seen them play, you just can’t help loving Robbo – the guy is just an absolute legend and a gent! You can pick up tickets either from the venue or by clicking this link and ordering one online from Gigantic.com. You could treat yourself to an enhanced ticket which includes a three course meal and waitress service for £35. Even though as a pundit he gets on my nerves a bit, the Birtles story is Roy of the Rovers stuff – plucked from obscurity to glory by Clough, from Long Eaton United for a mere £2,000. After a stuttering start he established himself as a quality hard-working forward, and snagged himself a couple of European Cup Winners medals along with a sizeable haul of other silverware. Of course, he then departed to Manchester United for £1.25m – quite the profit for Forest. At the time he was their most expensive signing. He turned out, frankly, to be a bit crap – and was the subject of national jokes – United finished only 8th and their manager Sexton was sacked as a result. A second spell at Forest saw him sometimes appear at centrehalf, but retained a goalscoring streak from 83-84 and through to 86-87 – playing alongside the players who started to come into the side and develop into my first Forest heroes. The likes of Neil Webb and Nigel Clough (spit!). Finally he was released on a free and ended up with a black and white theme with stints for Notts County and Grimsby Town before hanging up his boots. Now he’s very much the pundit, often co-commentating on Sky Sports and writing a column in the Evening Post. From carpet-fitter to European Cup winner, to obscurity and then a homecoming – that’s quite a story to go through, and he doesn’t even have to get on to the punditry! So it should prove to be a fun evening, with the not inconsiderable bonus of Woodcock and Robbo thrown in.